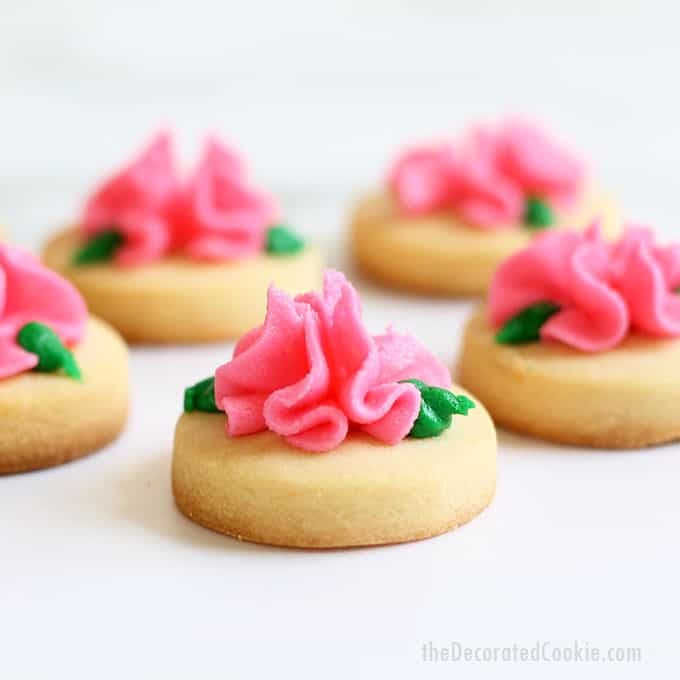 MINI ROSE COOKIES -- Buttercream frosting flowers on sugar cookies. 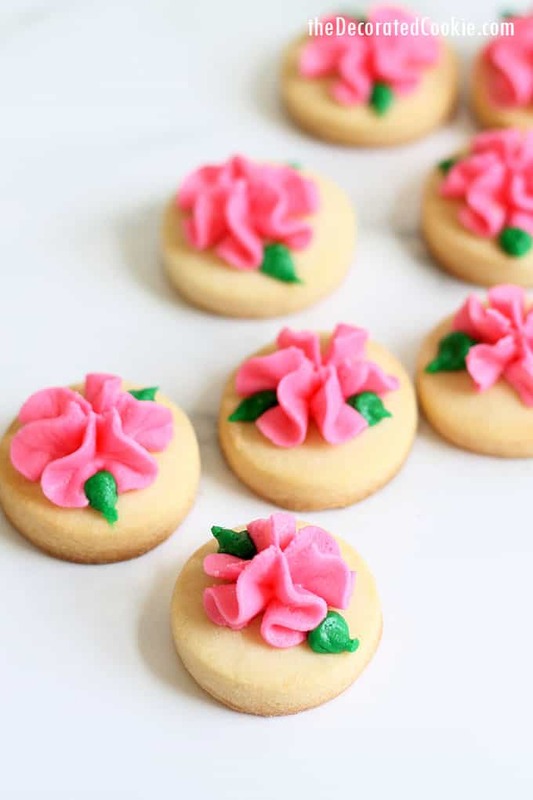 Mini rose cookies are so easy to decorate and perfect for a Valentine’s Day treat. 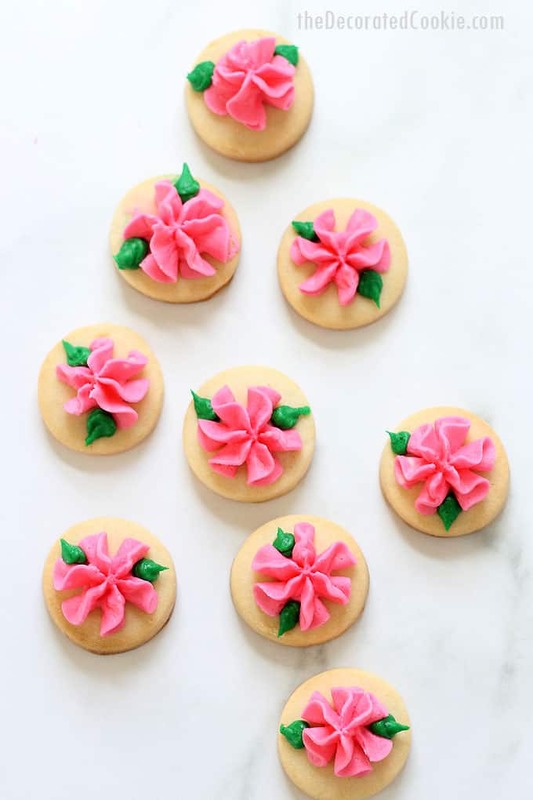 Need a cute and easy cookie idea for Valentine’s Day? 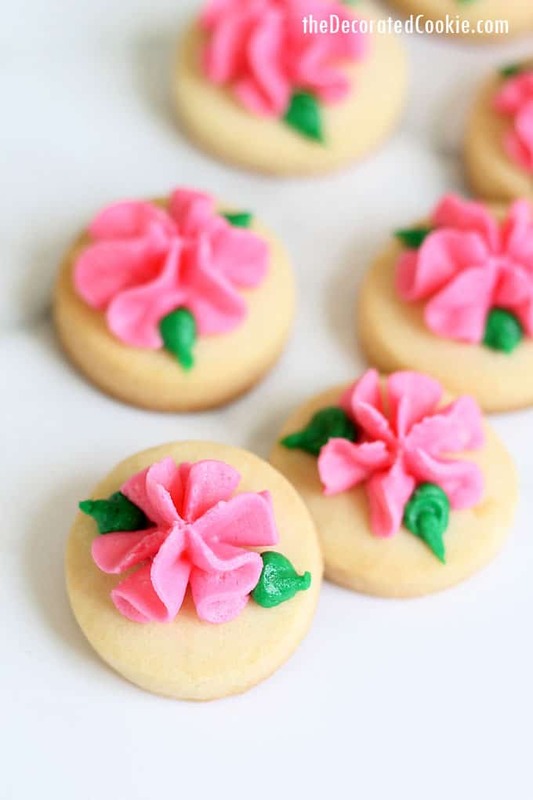 These pretty, mini rose cookies are the answer. Simply pipe a buttercream rose on top of bite-size cut-out sugar cookie circles. 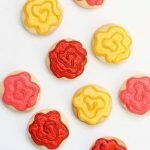 I made these rose cookies for the 2019 Good Cookie Food Bloggers Valentine’s Event, hosted by Julie of The Little Kitchen. We’re raising much needed funds for Cookies for Kids’ Cancer. Please consider donating HERE at the fundraising page. Every dollar helps, because the awesome sponsors, Dixie Crystals, Mediavine and OXO, are matching dollar for dollar (up to $3000 EACH)! And check out the “Baked With Love” merch! All of the proceeds will be donated to Cookies for Kids’ Cancer! And if your purchase is $75 or more & use this code FREESHIP75, you’ll get free shipping! Did you know that cancer is the #1 cause of death of children by disease in the U.S.? There are 40,000 U.S. children actively battling cancer right now and than 4% of the National Cancer Institute’s budget goes to all childhood cancer combined. Thanks to many of you, we have reached our goal. You can still donate and help us make an even bigger difference! 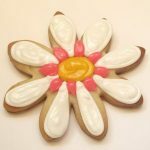 what type of frosting do you use to pipe flowers? Royal icing (a mixture of meringue powder, or egg whites, and confectioner’s sugar) is just right for cookie decorating and flat designs. It dries very well, so you can package and ship decorated cookies. 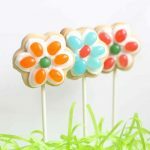 But to decorate cakes, cupcakes, and cookies with 3D designs, such as flowers, you should use buttercream frosting (a mixture of butter or shortening, confectioner’s sugar, and milk). For these recipes, I recommend either my traditional buttercream frosting recipe OR my bakery frosting recipe. how do you color frosting? I personally prefer to use Americolor Soft Gel Pastes. They blend beautifully and are tasteless. 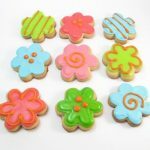 To make these cookies, I used Electric Pink and Leaf Green. What size tip do you use to pipe a rose? 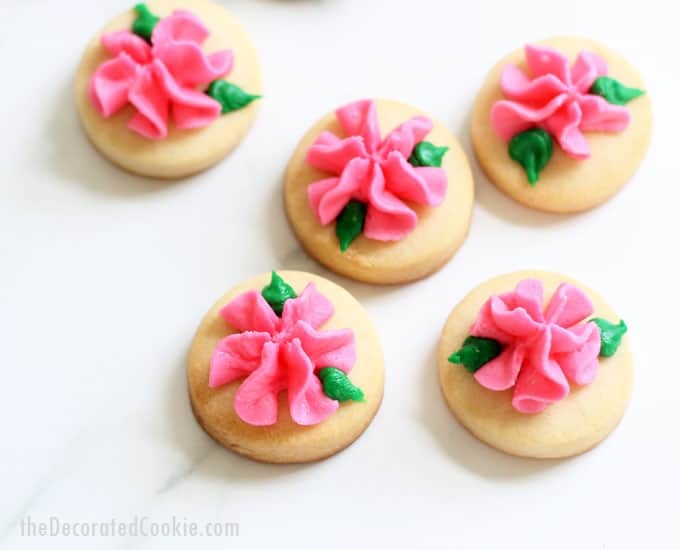 To pipe a rose on a cookie, cupcake, or cake, I suggest using size 1M or 2D tips. Here, I used a 1M (the tips are very similar). 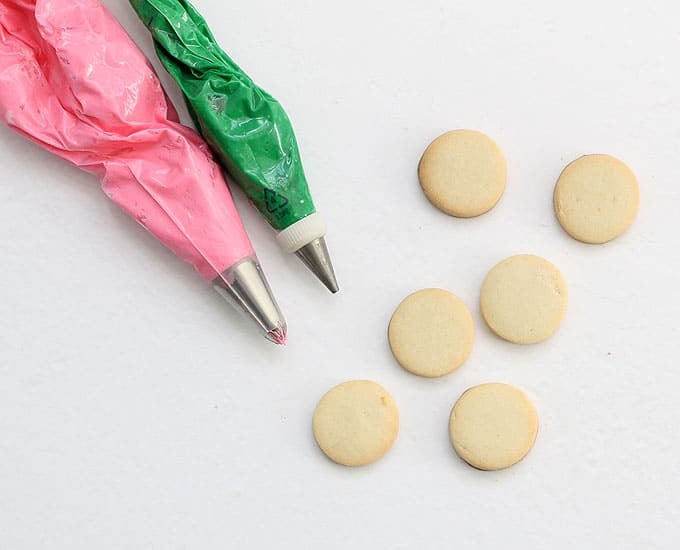 For mini cookies, you only need to pipe quickly and pull away. For larger cupcakes and cakes, you’ll pipe a spiral to create a rose. For the small leaves, I used a very simple, round 5 tip. To make a bag of frosting, you’ll also need disposable decorating bags. If you really want to have fun experimenting, try these Russian flower decorating tips. First, prepare cut-out sugar cookie dough according to the recipe, chill, roll out, and cut out little circles. I used the 1 1/2-inch circle from my circle cutter set. Bake and let cool completely. I made my bakery style frosting. Be sure to make the frosting a thick enough consistency to keep its shape. (Thicken with confectioner’s sugar and thin with milk.) I scooped out a bit to stir in Leaf Green food coloring. The rest I colored in the mixing bowl with Electric Pink food coloring. Prepare a disposable decorating bag with size 1 M tip and fill with pink (you may also use a 2D tip). Prepare another bag with a size 5 tip and fill with green. Close tightly with rubber bands. Meaghan, You are wonderful for creating and sharing this lovely recipe for such a worthy cause! Wow, what a beautiful recipe! Thank you so much for participating this year!